In 1862, the Home moved into premises at Frognal House, Hampstead. 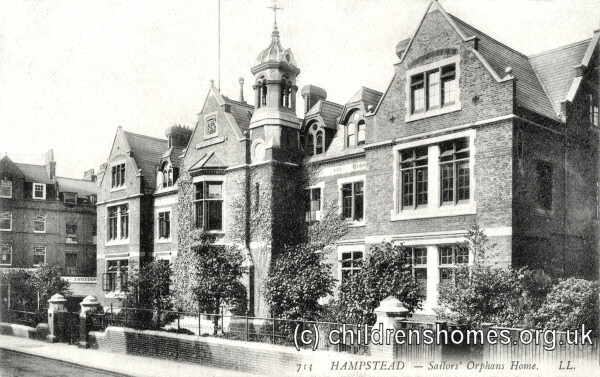 On July 16th, 1869, Prince Arthur opened new buildings designed by Edward Ellis at 96-116 Fitzjohn's Avenue, Hampstead, where around 100 girls could be accommodated. Admission to the home was by a periodic election amongst subscribers and donors to the charity who received up to 4 votes each depending on the size of their contributions. Admission could also be purchased by a payment of between £60 and £100, according to the girl's age. The Lords Commissioners of Admiralty and the Royal Patriotic Fund could also nominate girls for entry. Applicants, normally aged from 6 to 12 years at their date of admission, had to be approved by the charity's Committee. Unless in exceptional cases, not more than two children of one family were received at same time, and only one child of a family could be a candidate at a particular election. Guarantee for the eventual removal of the girl was required, together with certificates of the father's sea service, parents' marriage, child's subsequent birth, age and health. Girls were trained for domestic service and at the age of 16, or sometimes earlier, situations were found for them, outfits provided, and rewards for keeping situation given. Former inmates were supervised as long as they remained unmarried, and in approved cases given temporary accommodation when between posts. The home closed in 1957 and the buildings demolished to make way for council flats. The National Archives, Kew, Richmond, Surrey, TW9 4DU. File reference ED 30/57 covers the period 1879 to 1919.